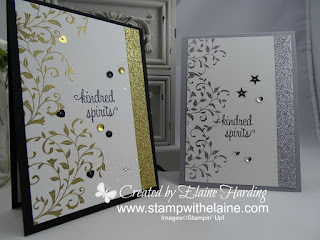 Silver Embossed First Sight meets Metallics Glitter Tape! I am in love with the Metallics Glitter Tape! This was one of the Free choices from Sale-a-bration's second release. This is a super quick card - the glitter tape and embossing gives it that WOW factor and of course a girl's gotta have some bling! So I threw that in the mix too! Which do you prefer, the gold or the silver? 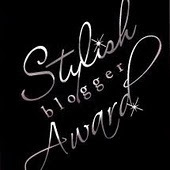 I'm told that gold is SOooo en trend at the moment! Happy Easter Monday! Going, Going, Gone! Including today there's only 4 days left of Sale-a-bration! What is Sale-a-bration? You receive a Freebie of your choice from the Sale-A-Bration 2016 brochures for every £45 spend! Don't want to hold a party? 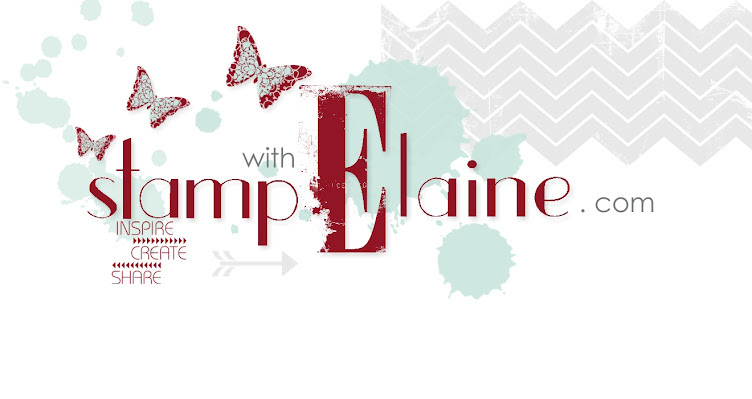 You can shop Online with me from the comfort of your own home! Remember to use the Hostess Code if your order exceeds £50 to earn extra goodies, but don't if your shopping basket is £150 or more as you will be able to keep all the rewards for yourself! 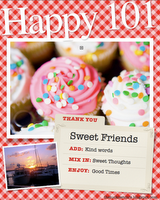 You'll also receive a "Thank You" gift from me! Win, win! Remember to select the "Yes" box so that I am allowed to contact you - otherwise I won't be able to send you your goodies! You can see what this part of the form looks like here under Classes on my website's home page, scroll down to Ordering Online Tips. Enjoy the rest of your Easter break! I know how precious time is! Happy Easter Everyone! 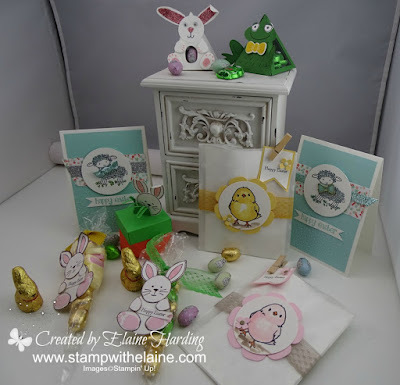 Just a vignette of all the easter themed projects I've done over the past few weeks. Can you spot who is the newbie in the group? Life got in the way and I didn't get round to doing a video on how I assembled her, but she makes a wonderful companion for Mr Toad! 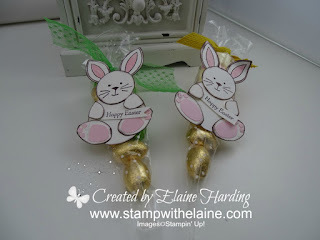 If you spotted my version of the Playful Pals bunny, you guessed right! 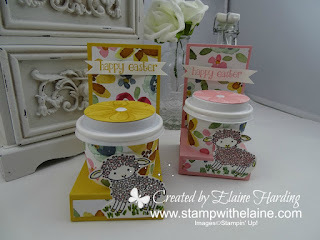 I couldn't include these cute little treat cups in the vignette as I'd given them away! I should have made more! I hope you're all having a wonderful Easter break! Pop back soon for more inspiration next week! Polka Dot Cello Bag Cones! Oh what a mouthful! - Polka Dot Cello Bag Cones...... Fill it with anything you like to suit the season or occasion! 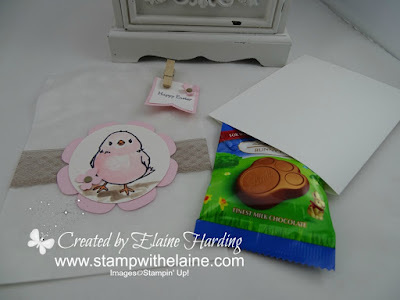 As it's coming up to Easter, I did some punch art with Friends & Flowers stamp set for the face, but the rest of the bunny was a combo of circle punches and the Festive Flower Builder punch. Enjoy! Do you remember the Walt Disney film "The Love Bug" starring Dean Jones way back in 1968 and the Volkswagen Beetle called "Herbie" which had a life of its own? I loved those films and couldn't resist getting the Beautiful Ride stamp set! 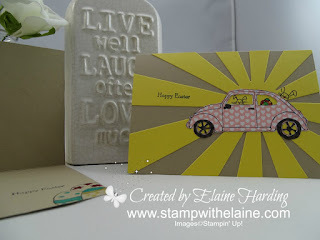 I totally "pimped" it into an Easter card which I'm sure wasn't how the Concept Artists at Stampin' Up! visualised it! 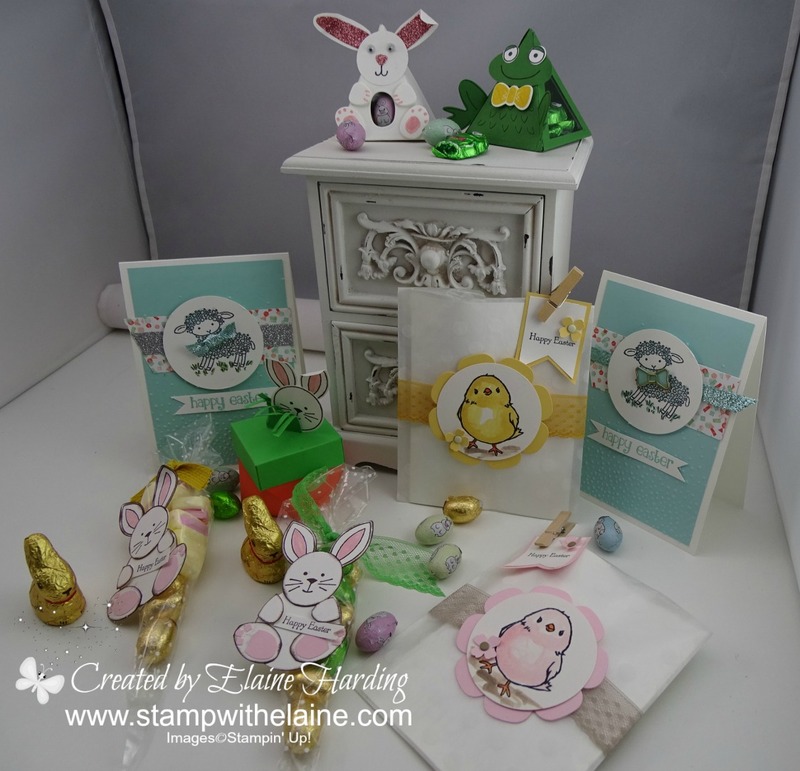 There will be more sensible creations after easter, I promise tee hee! Hope you like it! Hello Everyone! 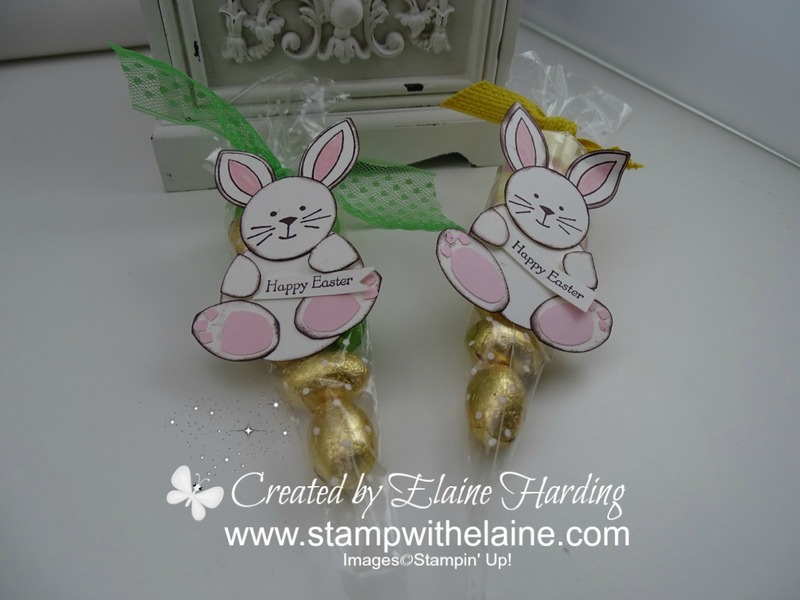 I have more easter treat packaging for you this Sunday. They're a cinch to make when you use Stampin' Up! 's Sketched Dots Gift bags. The chick is from Honeycomb Happiness - a free Sale-a-bration stamp set subject to a qualifying purchase and only available up until 31 March 2016. 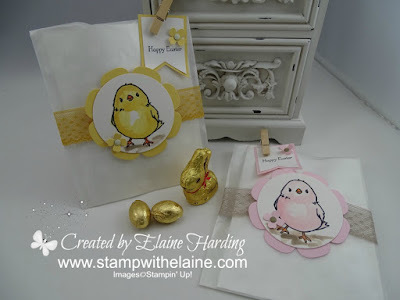 As the treats didn't match the colour of my chicks, I cut Whisper White cardstock 5 1/2" x 8-1/4" (14 cm x 21cm), folded it in half, glued the side and bottom to create a pocket and inserted it into the bag. The Chocolate Paw fits in quite nicely with room to spare. 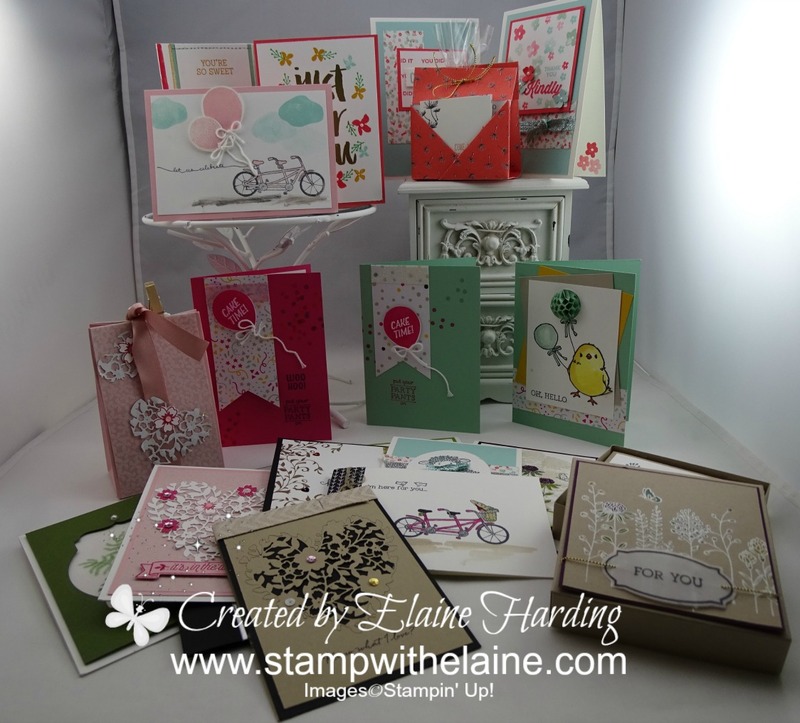 I used the triple banner punch for the tag layers and added some itty bitty flowers. So are you traditional and prefer your chick yellow and fluffy - or any colour of the rainbow? Mine is pink, but you could go wild and have Cucumber Crush to match the chocolate packaging, or Pacific Point perhaps? My eyes hurt, thinking about it! It's not just for Easter!